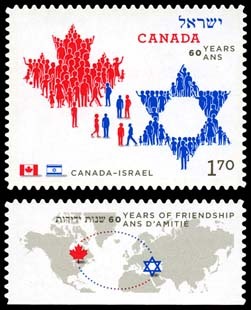 On April 14th, 2010, Canada Post began issuing a stamp commemorating 60 years of peaceful and cooperative relations with the nation of Israel. As a member nation of the United Nations, Canada was one of the countries who approved the creation of an Israeli state. On May 11th, 1949, Canada granted official recognition to Israel. It didn’t take long for economic and trade relations to develop between the two countries, with both nations providing each other with necessary products. Maintaining peaceful relations has been a priority for the Canadian government, especially since it has a large Jewish population. The $1.70 international rate stamp is the first joint issue with Israel in Canadian postal history. The design of the stamp carries through on the idea of harmony between different peoples, with images of human forms waving to each other making up the shapes of a Canadian maple leaf and a Star of David. Where can you get your stamps expertly valued & certified? WE CAN REALLY BE PROUD OF CANADA. ISN’T IT A SAD COMMENTARY ON OUR COUNTRY (THE U.S.} THAT WE, WHO ARE SUPPOSED TO BE ISRAEL’S MOST IMPORTANT ALLY, NEVER THOUGHT TO DO SOMETHING AS BEAUTIFUL AND MEANINGFUL AS THIS!! HAT’S OFF TO CANADA – YOU ARE INDEED A NATION TO BE APPLAUDED!! SHAME ON US.